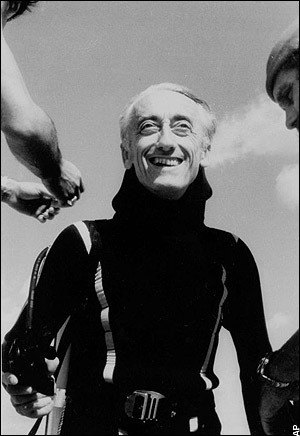 The Force Expansive: Happy 100th Birthday, Jacques Cousteau! We went to Nightlife at the Academy of Sciences last night, for the debut of Ocean Voices and to observe the 100th anniversary of Jacques Cousteau's birth. 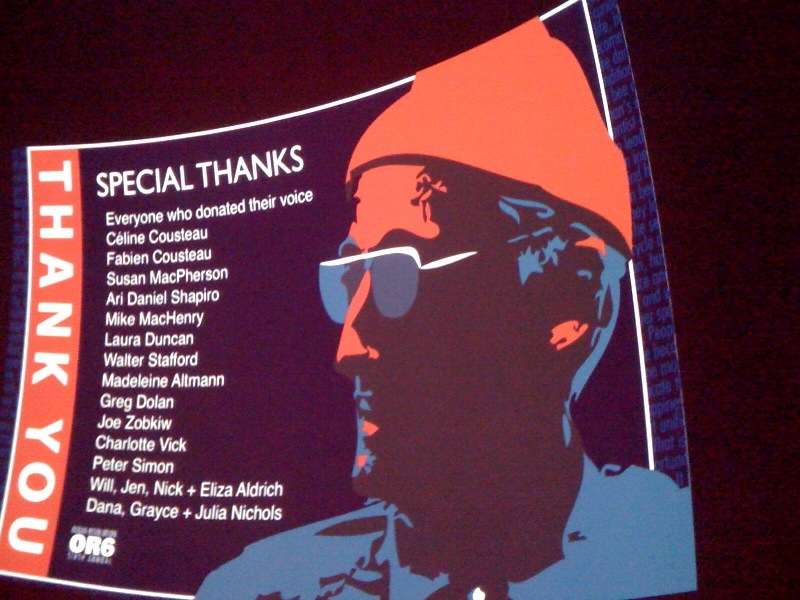 When I read about this event on-line and that two Cousteau grand-kids (Fabien and Celine) would be on hand to introduce the special show in the Planetarium, it was a done deal. I know I'm not alone: I can only imagine that my generation of kids -- those of us who grew up in the 60s and 70s -- was pretty universally glued to Cousteau specials on television, grew up wanting to be him. He is definitely a hero of mine from early childhood, so it felt like a necessity to be there, particularly in light of this madness with the oil spill and following on the heels of our dreamy morning tidepooling at Duxbury Reef last weekend. Having been to Nightlife a few times now, I feel like I have the system down. My timing was pretty perfect in arriving. We were first in the Members line. I know that's utterly meaningless, really, but I enjoyed knowing that my feet would be the first in the door, guaranteeing that I'd be able to snap up tickets to Ocean Voices (done), then head downstairs champagne in hand, to enjoy the quiet, empty Aquarium. And dream come true: the giant Pacific octopus was on the side of her tank, eye-level, in all her glory. This tank is my first stop *every* time I visit, the sight I most crave. To be able to stand in that dim room, just Joe and me, and look at her eye, watch her breath, observe the tip of one tentacled leg slowly curling and unfolding, was such a treat. And moments later, we were joined by someone in an orange Academy coat who regaled us with info about this particular animal and her kind generally. Oh, other than being underwater, that is so my favorite! So many of the creatures we saw in the Aquarium last night seemed so much more active than usual, or than I've ever seen there before. The flounders were cruising around, eels, too. I've decided that I'm not the target audience for Nightlife. I do appreciate the lack of children and strollers --that's Genius, really. I like having an experience of the Academy that is not about it being a playground. And there's something wonderful about looking into brilliantly-colored displays with a drink in your hand, especially before it gets crowded. But Nightlife is its own form of playground, for grown-ups, and I'm not sure it's the experience I really want to have, either. I wonder whether there needs to be so much going on at once in one night: really, do we have to have two DJs and the Crucible with their fire stuff happening outside and in the center area and the usual theme-based tabling, not to mention all of the regular Academy happenings, the volunteers pushing around carts of skulls or bacula? I'd be happy with just one thing, and maybe a jazz trio for example. Maybe a quieter version of Nightlife, just once, so that I could avoid the feeling I had in the Extreme Mammals exhibit last night, around 9pm, that I was back in high school surrounded by tipsy idiot girls in party dresses. But, no matter what, I was so glad to be there, to be in the same room with Cousteaus, to dedicate the great excitement that I feel when I see marine creatures back to the person who first unveiled this universe to my eyes: back to the original Zissou, Jacques Cousteau. Long may we honor all that you gave us!